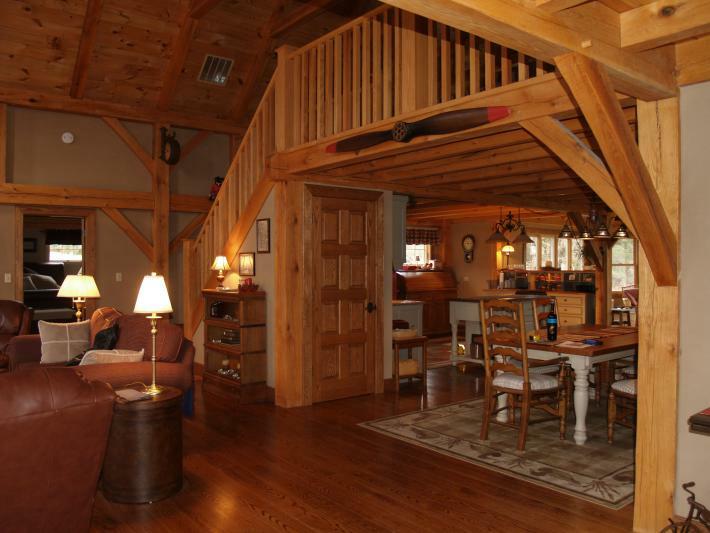 With a plane in the hanger/garage and a driveway as a taxi-way, this timber frame home is just a couple hours from most destinations in the northeast! 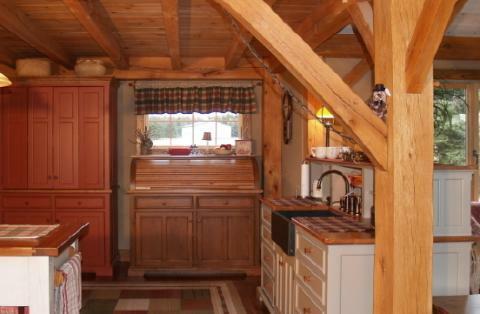 And a timber frame is a perfect background for installing separate pieces of furniture in the kitchen. Instead of installing wall to wall cabinetry that typically hides the structural framing, Kitchen Workstations allow the structure to be seen, maintaining the integrity of the design. In this kitchen, five workstations (not including the white center island) completely conceal all of the hi-tech appliances except the Ceran cooktop. The pine Roll-top piece conceals a working countertop and everyday dishes. The Painted working pantry is used as a baking center and features a marble top. The painted Sink piece with Cherry counter tops separates the kitchen from the family room. The Range’s vented door panels conceal the two ovens. The distressed Pine corner cupboard conceals a Subzero 700 refrigerator and has two 6″ side pantries, accessed from each side’s bi-fold door panels. 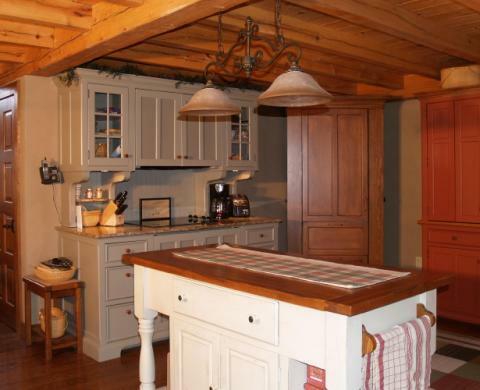 Using YesterTec’s freestanding workstations allowed this kitchen to have all the conveniences that hi-tech appliances imply while maintaining a low-tech, period style that compliments the post and beam structure. Please click here for more information about this Post and Beam kitchen.